Last weekend my husband and I went out for a low key dinner to celebrate my birthday. I decided to wear my new Anthropologie Hummingbird poplin skirt. I know, another species of bird to add to the flock! When deciding on how to style this skirt I was inspired by various artists in their use of all primary colors. Putting together an outfit takes me back to art class and learning about the color wheel. Getting dressed is really like constructing a painting in terms of figuring out which colors compliment one another and work together. 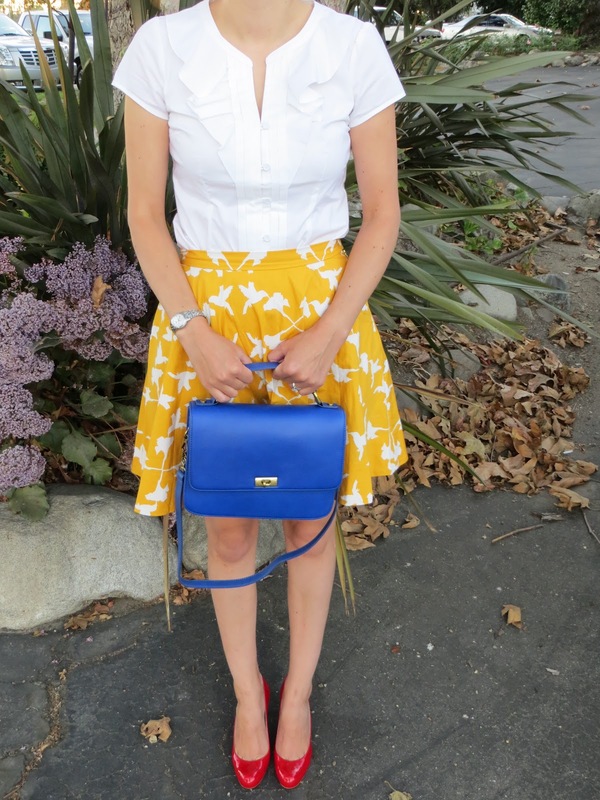 I paired my cheerful yellow skirt with my Christian Louboutin red Simple Pumps. Actually the shade of red labeled on the box is Coquelicot to be precise. I think a classic pair of red patent pumps should be in every woman's wardrobe. Another staple is a classic, crisp white shirt. The one I am wearing in the above picture is from Ann Taylor Loft. I like the ruffles as it gives a classic a bit of a twist. 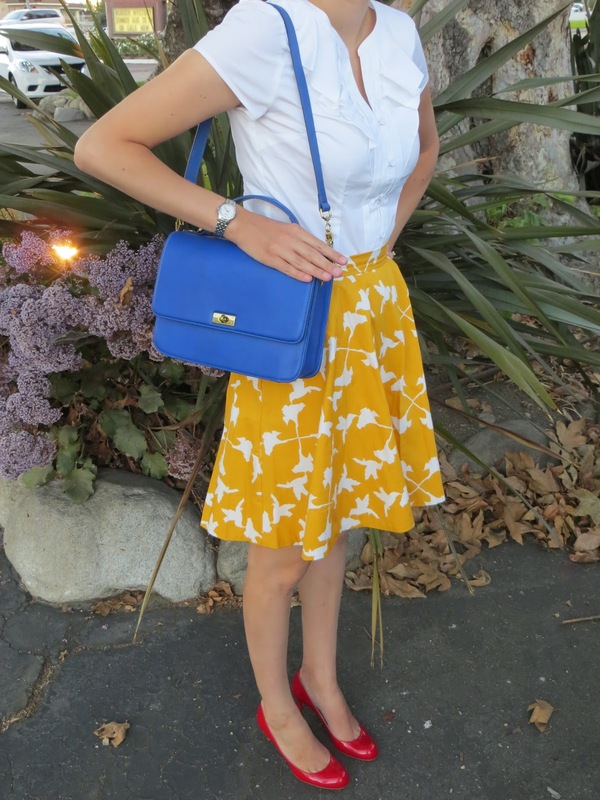 To top off my ensemble, I debuted my new Edie bag from J. Crew. The color is Casablanca blue. I love, love this color as it is so rich. It is a little bit like International Klein Blue. International Klein Blue is a color created by French artist Yves Klein. Klein's goal was to create a color with a strong intensity which mimicked the vibrancy of dry pigment. With the help of chemists, Klein was able to do just this, resulting in a color that looks very similar to my bag. Klein used this color in various monochromatic works (literally a single canvas painted in this color) along with some of his performance art. 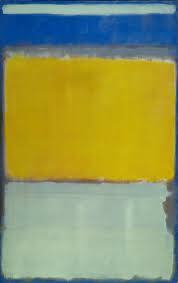 Above: Mark Rothko's no. 10 created in 1950. My husband would say, "I could do that!". Perhaps that is what you are thinking too! I personally think Rothko's pieces are very beautiful to see in person due to the immense size of the canvas he painted on. He was a master at using color to evoke emotion. 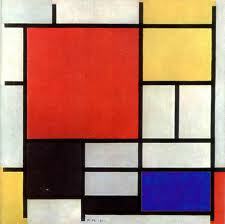 Above: Piet Mondrian (I am unsure about the title, but I am looking into it). My husband's remark to this painting would be, "I could do that if I had a ruler!". Well, I hope you enjoyed my outfit and a little side of art history! Do you have any works of art which inspire you? Oh Katie I love this - and the art comparisons too! Thanks Laura! I am an art lover, so I try to see connections between art and fashion whenever possible. Thanks phiphi! Your Edie bag looks incredible too. I am so happy I picked this color! I adore this outfit! The skirt is adorable and the colours just all mach perfectly! Thanks for checking out my blog Stacey!